As you may have noticed, we love to have messy materials at LEAP! I discussed some of the benefits of toddlers experimenting with different textures and materials during the previous 'Art: It's the journey, not the destination' post. But messy materials also take a lot of preparation and clean up, so how can you encourage creativity in a quick and neat way when you just don't have the time for a messy activity? One of our favorite simple activities is the felt board! Felt boards are an easy thing to make at home and pull out for easy, open-ended play. By cutting the felt into all kinds of shapes and sizes, kids can use them for imaginative play- building faces, trains, trees, or whatever else they can think of- or they can use the shapes and colors to make comparisons. They can find all the yellow pieces and put those on the board, or find all the squiggly pieces and lay those out together. You can also be deliberate about the shapes or colors you provide sometimes in order to introduce or encourage different learning points- for example, you could give your child all triangles one time or all different green pieces. There are endless ways to play with this simple activity! Here are the 5 easy steps to making your very own felt boards. 1. Buy foam boards at a craft or hardware store. We especially like foam boards versus other materials because they are nice and light for easy transport. 2. Buy chunks of felt that will fit over the boards (make sure there will be extra space on all sides), and get other colors of felt to cut up for the play pieces. 3. Fasten the felt to the boards. We like these long pins pictures below because they sit flush up against the boards and do not come off easily. 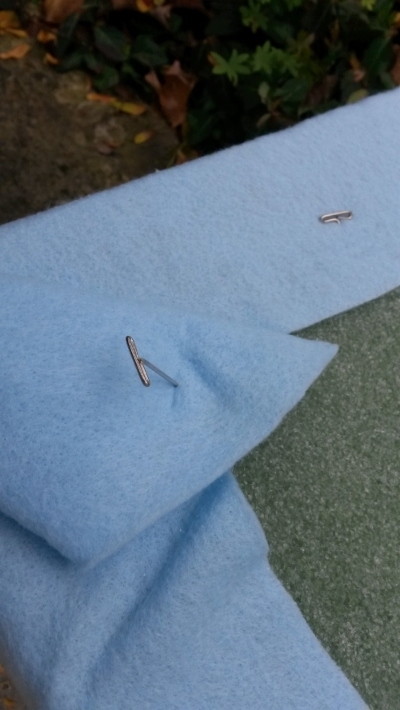 What's nice about the pins is that you can remove the felt to wash it periodically. You can also glue down the felt, but that does limit the washing ability. 4. Cut up the rest of your felt into lots of fun shapes and sizes.